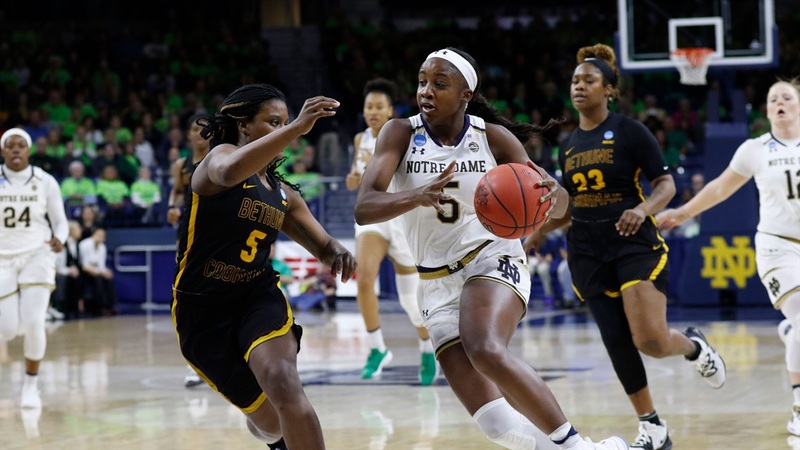 Notre Dame started defense of its national championship with a 92- 50 win against 16-seed Bethune-Cookman to open play in this season’s NCAA Tournament. The Irish came out of the gate a bit sluggish and only led 11-7 at the first media timeout. They came out of the timeout with a greater intensity and outscored the Wildcats 18-5 to close the opening quarter. ND then held BCU scoreless for the first seven minutes of the second quarter to lead by 32 at the half 51-19. Arike Ogunbowale led the Irish with 23 points in 27 minutes of playing time. Angel Golden of Bethune-Cookman led all scorers with 25. She scored 18 from beyond the arc making 6 of her 20 three-point attempts. Her ability to get shots off disappointed Notre Dame head coach Muffet McGraw. The Irish strength was the inside game that produced a 58-10 points-in-the-paint advantage and a 20-3 edge in second-chance points. Jess Shepard scored 22, and collected 13 rebounds and two steals to go with four assists. Brianna Turner was a highly-efficient 8-10 from the field for 19 points. She added nine rebounds and had five blocks. Shepard and Turner combined to go 7-8 from the free throw line. Mikayla Vaughn came off the bench and just missed a double-double in 23 minutes of playing time. She ended the day with nine points and 11 rebounds. The Irish out-rebounded the shorter Wildcat squad 49-28. Jackie Young chipped in with 11 points, four rebounds and four assists. Marina Mabrey failed to score for the only time this season, but she led the team with 7 assists and added 3 steals. Overall, ND assisted on 24 of 36 baskets. After the game, McGraw said that Mabrey was nursing a hyper-extended knee, and limited Mabrey to just 23 minutes of playing time. No Irish starter played 30 minutes, as Abby Prohaska, Dani Patterson and Vaughn gave a combined 56 minutes of relief off the bench. After scoring just 19 points in the first half, the Wildcats added 31 after the break by making 6 of 17 three-point attempts and 9 of 11 from the line. For the game, the Wildcats made nine three-point baskets and just seven inside the arc. They only had 2 two point field goals in the second half. This was Bethune-Cookman’s first trip to the NCAA Tournament. The Wildcats made it by winning their conference tourney despite enduring five season-ending injuries along the way. All Irish starters were out of the game with 6:42 remaining in the fourth quarter. The bench managed 10 points the rest of the way to help ND top 90 points for the ninth time in the past ten games. Notre Dame shot 54.5% from the field overall and hit 5 of 10 three-point attempts. The Irish were 15-18 from the free throw line (83.3%). The Irish advance to the second round of the NCAA tournament and will play the winner of today’s second game between Central Michigan and Michigan State on Monday.